Tumble those dirty plated parts with walnut shells or ground corn cobs and polishing compound to make 'em shine again! Try cleaning dirt and minor rust from plated parts with chrome polish or Brasso® and a soft cloth; use 4-0 steel wool with the polish for more stubborn stains. Welcome to our How-To Workshop, where we've gathered a variety of information for construction set collectors and model builders. Whether you are cleaning up an older set for building, performing a full restoration of a collectible set, or designing or building a model, we probably have something here to help you. Don't see what you need? Write in and let me know. NOTE: The restoration tutorials presented on this page were provided by G&G readers. We offer them here as a public service only - Girders & Gears is not responsible for any problems that may result from their use, and we make no guarantee that a particular method will work as well for you as it did for the person who submitted it to us. These are something I came up with for the 8½ Ferris Wheel model, 4 custom seats of my own design. I always found the "baskets" shown in the book to be lacking any resemblance to the real ones. When these are hung from the front hole of the P79, the shaft is like the guard bar & the seat hangs like the real ones. 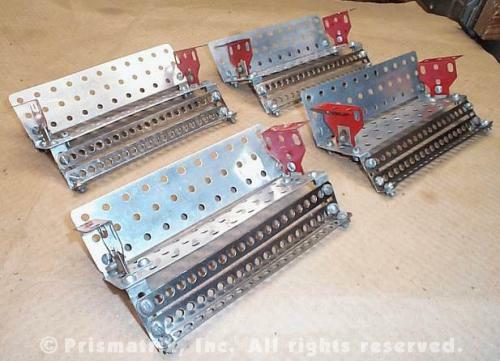 Parts include - 64 nuts & 64 screws, 24 CH angles, 12 I 21 hole strips, 8 O pawls, 8 P79 trucks & 8 MF 5" flat plates. Bolt 13 curved girders together to form a "circle"; leave the last bolt out for now. 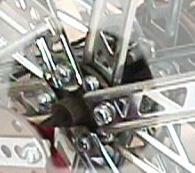 Loosely bolt two 10" straight girders to opposite sides of a BT 8-holed disk; this forms a "straight line" spoke pair. Bolt one end of the spoke pair and the loose ends of the circle together with a single bolt. You want the spoke pair to bisect the wheel, so starting at the connection you made in Step 3, count around the wheel to the 7th curved girder and and bolt the other end of the spoke pair to the center hole of that girder. Each "half" of the wheel is now 6 1/2 curved girders long. Starting at the same location as you did in Step 4, count around the wheel to the 4th curved girder and bolt one end of a 10" girder to it, halfway between the first and center holes. Bolt the other end of the 10" girder to the BT disk. Repeat this process on the other side of the wheel. You now have a wheel divided into quarters by 4 spokes; each of these quarter circles is 3 1/4 curved girders long. Now just bolt 4 more 10" girders to the remaining holes on the BT disk, then bolt their other ends to the wheel halfway between the existing spokes. Now, let's deal with the wheel hubs where the spokes attach. At first, I found it difficult to bolt all eight spokes to the hub at the same time, as there appeared to be insufficient room for eight screws plus girders to bolt around the BT wheel. Here is a solution: bolt four girders (90 degrees apart) to the inside of the BT wheel, the other four to the outside of the BT (see photo). In addition, rotate each girder a few degrees off of perpendicular to the center of the BT; this will open up enough clearance for all eight screws to fit through the holes. Finally, be sure that the set screw on the BT does not line up with one of the inner girders; if it does, you won't be able to get a screwdriver on it. I found the standard issue blue string included in my Erector set to be too heavy to permit proper motion of the parachutes on the Parachute Jump - fishing line or sewing thread works much better. One more thing: when I purchased my current 10½ set, the one I usually build with, I wanted to have the closest thing to an original set as possible, so I opted for the Collector's version with the blue cardboard inserts. 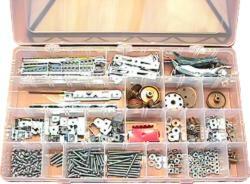 However, because I bought the set to build with, after carefully unpacking it I stored away those inserts, along with the four parts cans, and transferred all of the hardware, smaller parts, and tools to a plastic organizer (shown here). Remembering how I had to fish around in my old set for the right item, I decided to do it right this time. And it has been the perfect answer: the organizer is flat, and just fits inside the new set, while the larger parts stack around and on top of it. Here are a couple of shots that show detail of the top of the 1940-1948 design tower. The original lift using NT cones was simple in theory but a bear to execute. The chutes ride up and down on fixed lines. A washer near the bottom stopped the chutes before they hit the base and held them for the NT cones to pick up. 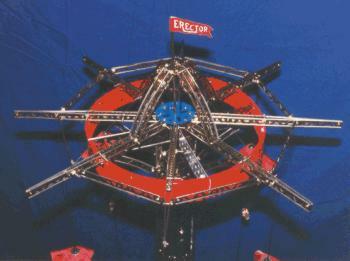 The fairly heavy NT cones were raised/lowered by the electric winch. By allowing them to nearly free-fall, they slipped over the chutes and held them by friction (assuming they had sufficient downward velocity). The cones, with their chutes, were pulled up by engaging the winch. There are washers on the fixed lines near the top of the tower. The NT cones were raised past these and the washers caused the chutes to be pulled free of the cones and drop. As if this wasn't tricky enough, you had to quickly stop the winch before the cones hit the arms of the tower and broke the strings. At this point the winch was disengaged allowing the cones to drop onto the chutes and the process started again. As you can see, the old arrangement didn't allow you to start it up and then stand back to admire the fun. I got it to work just for the challenge, then went back to my original idea of the hybrid. I think the older tower looks closer to the real one at Coney Island (I rode it once in the late 50's) and it was the one I dreamed of when all I had was a number 1 beginner's set. I left the fixed lines just for keeping the look of the original. One last thing and I think this was a slick idea---When the chutes get to the bottom, they stopped abruptly. The real jump used bungees to cushion the riders at the bottom so I attached the lift lines to a small elastic band and tied the band to the take up reel. Works just like the real jump and probably adds to the longevity of the knots in the lift lines.